When we were starting out on this adventure and knew that we would run into some cold temperatures. Most RVers head south when it comes time to winter camp to get to warmer temperatures. We were faced with the problem that the snow skiing isn't very good near the Mexican border. Part of this adventure is really about learning how to overcome obstacles so we can become more proficient travelers. Without further adieu, here is our Dickinson P12000 Review. There are loads of different types of propane heaters available and most of them will indeed heat up a room, but lets talk a bit about safety. The biggest problem with ‘ventless' heaters such as the Mr. Buddy heater is NOT that they put off some kind of CO gas or other harmful gas but they USE up your precious breathing air. Fire needs three things: fuel, oxygen, and heat. The hotter the fire burns, the more of those three items the fire needs. A propane heater, no matter its type, is essentially making a flame. Why is this a problem? If you are using one of these heaters in a small space like an RV, the heater will use up the oxygen in your RV that you are using to breathe. Now, most of these heaters like the Mr. Buddy do indeed have ‘low oxygen' sensors. That's great and everything, but a sensor can fail and you will likely not realize it until it is too late. If you are awake, you will likely be able to tell the oxygen level in your RV is low because you may get dizzy, lightheaded, your heart will race, you will feel like you can't catch your breath, etc.. If you fire up your Mr. Buddy heater and snuggle down in the blankets for a warm nights sleep, it could be a fatal mistake. The fact that the Dickinson P12000 Propane Heater is so safe is why I picked it to run while my wife and I sleep in the bedroom of our RV. 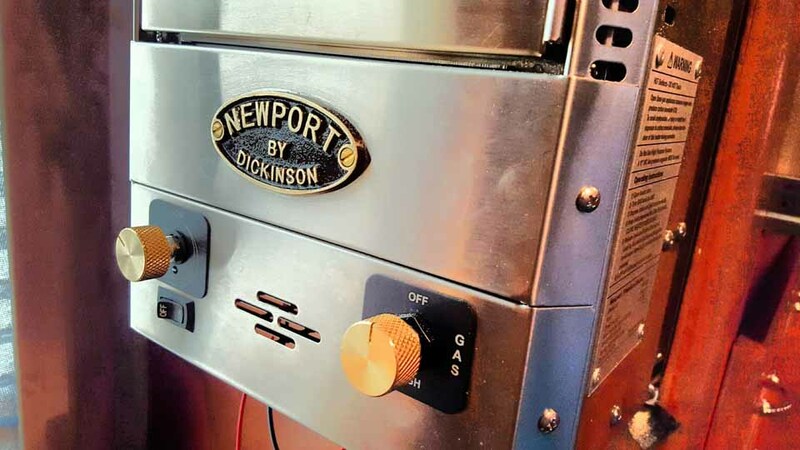 The Dickinson P12000 Propane Heater uses outside air to fuel the fire by using a ‘dual chimney' if you will. The chimney is both an intake and an exhaust. There is a chimney inside of a chimney (a chimney inception!). The inner chimney is where the heated fire gasses and CO get expelled through the roof. The outer chimney is where the fresh air from the outside is brought into the fire place. The actual ‘combustion chamber' is completely sealed off from the room you are staying in. Basically, unless the fireplace is installed incorrectly, there is NO chance of the fireplace depleting the oxygen in the inside of the RV. Yay Safety! 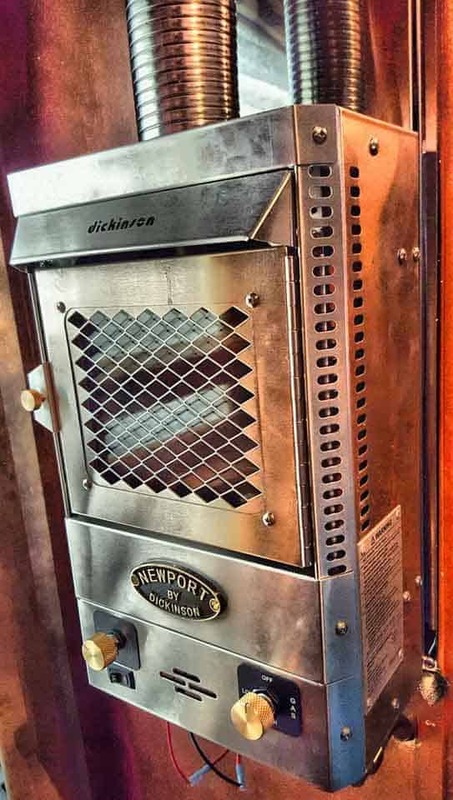 We would consider this the best propane heater on the market. Dickinson P12000 Propane Heater Installation. I wanted the chimney to go straight up out of the ceiling without any curves (although it CAN curve a bit). You don't want to mount this in a slide as the chimney will get in the way of the slide operation. If possible, mount this heater near a propane line. I mounted mine to the side of the cabinet in the bedroom that contains the furnace, so tapping into an existing line was very simple. Use a 3″ hole saw to cut a hole in the roof where the chimney will go (I cut from the inside to the outside). Investigate the area well to make sure you aren't going to saw through any wires or frame members. Crawl up on top of the RV and lay a bead of Dicor Sealant (or other approved sealant) on the included rubber gasket. Press the gasket around the hole in the roof. Lay another bead of sealant on the top of the gasket and place the chimney cap on top of the gasket. Screw the chimney cap down with the included screws. Seal all of the screw holes and the edges of the deck cap with the Dicor Sealant. Install the heater and chimney. I used the full length of the chimney as I did not want to cut it and I did not need to add on to reach the chimney. This is the easiest way to do this. Also, this is easier with a helper. Fit the chimney on the inner and outer portions of the deck cap and have your helper hold it there. Take the decorative chimney ring and place it around the chimney port of the heater. Take the heater and fit the inner and outer chimney onto the top of the heater and place the heater on the wall where the chimney is snug on both the deck cap end and the heater end. It is VERY important that the inner chimney is secure on both ends of the chimney. Screw the heater to the wall. I also placed a strip of 3M double sided foam tape on each of the mounting rails to reduce vibration and add a little stability. I had a 3/8″ copper line that was nearby to tap into. Fortunately, this line was also the same pressure that I needed for the heater. Dickinson recommends that you install another regulator, so know that. I felt it was redundant and so I skipped that step, but know what Dickinson recommends and know what I did and make your own decision. MAKE SURE THE PROPANE IS OFF and use your tubing cutters to cut the propane line. Use your flaring tool and flare Tee to make a tee for your rubber propane hose to connect. I used a rubber propane hose that is for a grill, but Dickinson makes a hose as well. As far as the fittings, you will just have to play around with the fittings at Lowes to find the ones that will fit your specific application. Run the supply hose up to the heater and tighten the fitting to the heater. Once everything is snugged up, spray the fittings with some soapy water and watch for bubbles to make sure you do not have leaks. If you have leaks, tighten up the fittings or make other necessary adjustments. There are two wires on the bottom of the heater that need to be hooked up to a 12v wire. This is pretty self explanatory. Find a 12v wire, splice into it, and run the negative wire to the negative side of the fan and run the positive wire to the positive wire of the fan. Now that it's all installed, open he front door of the fireplace, hold a lighter inside the fireplace, turn the knob to low and push the knob in. (There may be air in the line, but just keep holding the knob in) Once you have fire, hold the knob in for about 20 seconds while slowly closing the front door and latching it. We have been using this heater for the last 4 nights. Last night, it got down to -21 degrees Fahrenheit up here in Kremmling Colorado. We used a combo of the RV Furnace, the Dickinson P12000 heater, and a space heater to get the bedroom up to temperature. Once it was up to a good temperature, we turned off the space heater and lowered the Temperature of the RV Furnace to 45 and the RV Furnace never turned on. The space heater turned on a time or two, but for the most part, the Dickinson P12000 kept our bedroom easily in the 50's, which under a few blankets, is entirely comfortable. I do highly recommend this heater as it was able to keep our RV bedroom that warm when it has been SO frigid outside. Just make sure the altitude is from a few measurements. GPS are notoriously bad a finding altitude even at the best of times. Giving +/- 50 feet in the best of times, presuming you’re not using differential GPS.You’re also not really getting the altitude above sea level. GPS give you the altitude above the 1984 datum, which may or may not be close to 1984 sea level depending on your location on the globe and the error inherent in the ellipsoid model.If you’re in the US, and have an internet connection, there are a few APIs you can use to find elevation based on lat/long and some government data sets from things like the shuttle missions and the USGS. I just wanted to know if it can still run when blower battery depleted? At cottage we have propane ‘looks like wood stove’ unit and it can run when power failure occurs. Yep! It will still fire up and run, but just won’t circulate air.